People all over the world are fascinated by "spirit orbs" – the opaque circular features that appear unexpectedly in their digital photographs. But now that so much serious research and study has been done on the topic, the big question is, what does their appearance mean? This book shows that these fascinating circles of light are not just interesting phenomena, but that they are here for a specific purpose – to bring us messages of hope. Written by orb expert and physicist Dr. Klaus Heinemann, together with his wife Gundi Heinemann, a healing arts practitioner, this book is a grounded and visionary presentation of facts and experiences in orb photography. You will find convincing new results to intrigue the skeptic, supported by numerous reports of meaningful orb experiences from people all over the world. This book delves deep into the magical and exciting world of orbs, how and when they appear to us, and beyond – exploring what these emanations from spirit are trying to communicate. In a chapter on "spiritual healing" the authors hypothesize a connection between spirit orbs and the spiritual healing phenomena experienced at the Casa de Dom Inacio in Brazil. 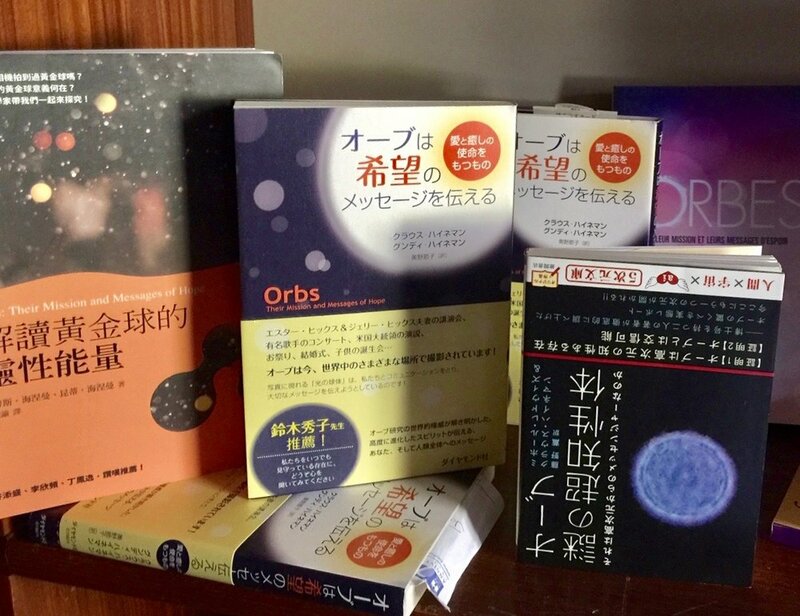 "Orbs: Their Mission and Messages of Hope" has been published in several languages, including German (co-edited/translated by the authors), a superb edition in Japanese (translated by Setsuko Okuno, who spent countless hours with the authors to assure proper transposition of the nuances), and most recently (2016) in French. "Orbs: Their Mission and Messages of Hope" follows Klaus Heinemann and Miceal Ledwith's earlier book The Orb Project, which has been translated into numerous languages, including German, Italian, Dutch, Bulgarian, French, Japanese, Russian, and Chinese. Being the Change-- How an ordinary woman affected the world in an extraordinary way by living the wisdom teachings with totality, by Klaus and Gundi Heinemann. ISBN-10: 1493673645• ISBN-13: 978-1493673643; 146 pages; 40,000 words (2013). Available at amazon.com. Klaus and Gundi invite you to be inspired by profound teachings and stories of transformation of master teachers and outstanding contemporary individuals they were privileged to work with. They show how the miraculous is active daily and readily available to help us live extraordinary lives. This book presents Emilia Rathbun, one of their greatly loved teachers for 35 years, who awakens the unique identity and holiness each one of us is gifted with and is encouraged to express while on planet Earth. This book has a major section on prayer, in particular the Lord's Prayer. Klaus and Gundi have taught numerous human growth seminars and lectured nationally and internationally on their work. They were featured on many radio and TV programs. Together they serve as Guides of the Casa de Dom Inacio in Abadiania, Brazil and lead numerous groups to experience Joao de Deus. ISBN-10: 1492910805• ISBN-13: 978-1492910800; fully revised and extensively expanded 2nd edition, 294 pages, 80,000 words (2013). This is a visionary, easy to read presentation of a scientist’s grounded view of the spiritual reality, based on a thought experiment extrapolated from the wave-particle dualism principle in quantum physics. It presents conclusions concerning the evolution of conscious consciousness, the permanence of souls, reincarnation, synchronicity, premonitions, the law of attraction, prayer, spirit emanations (orbs), EVP experiments, and spirit-directed healing. Over 50 pages are devoted to the subject of "spirit-directed healing. "Expanding Perception" reminds the reader of the innate healing ability which everyone is gifted with. The authors present numerous healing stories they experienced during their service as Guides to the Casa de Dom Inacio in Brazil, where John of God works. Also, well known as pioneering experts in "Orb" photography, the authors present in this book new, plausible explanations for the orb phenomenon -- which may be inter-related with the phenomena of crop circles and even UFOs. "Expanding Perception" might well enhance your own sense of awe and wonder and gratitude to be a part of the Grand Original Design. ISBN-13: 978-1-58270--182-0 Beyond Words Publishing, ATRIA Books, Simon & Schuster (New York, 2007); 176 pages and 64 color photo pages; US$18.95. In recent years, people have wondered if the spherical objects that sometimes appear in their photographs are simply dust particles -- or something more. In The Orb Project, physicist Dr. Klaus Heinemann and theologian Dr. Miceal Ledwith, two leading experts in the field of the orb phenomenon, combine their years of knowledge to examine these apparitions. Featuring, in full-color, different types of orbs, fascinating research findings, practical tips to guide amateur photographers in capturing images of orbs, as well as comprehensive guidelines on orb visual patterns, characteristics, and habits, The Orb Project demonstrates that our conventional physical reality is merely an extension of the limitless spiritual dimension, and that orbs are connected with realities outside of our normal human perception. This book is available in German, Italian, Dutch, Romanian, Russian, Japanese, Chinese, Spanish, Croatian, Lithuanian, Greek, French, and other languages. The books are available at bookstores and Internet-book outlets, including Amazon.com.